Most board games on the market, and most of the ones that we’ve covered here at GodisaGeek, are won by a single player utilising a skill that the other players don’t have. Perhaps they’re won by a stroke of luck before that element of skill can kick in, but they’re almost never won by a show of pure creativity. 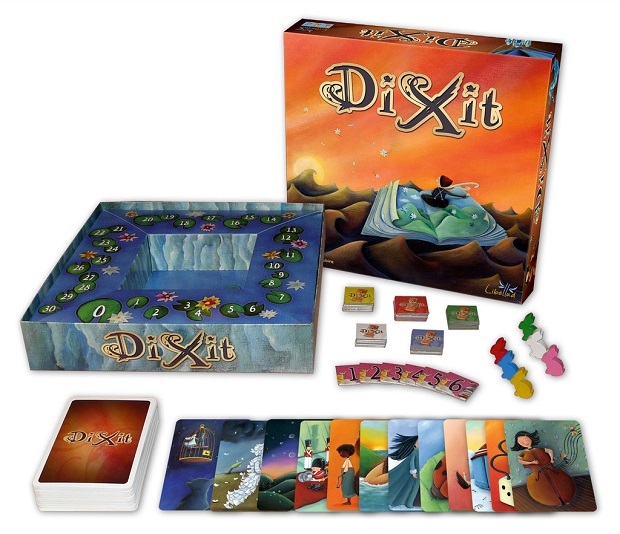 That’s where Dixit comes in as something slightly different to what most people are used to pulling off the shelf on board game night. The aim of the game is to create a story, a phrase, a sound or even a single word based on one of the cards in the deck of six in your hand. Once you’ve created the phrase you want to use, you then ask the other players to pick one of their six cards that closest matches the phrase that you’ve said. They all then give you this card. The storyteller – the person who came up with the phrase to begin with – then shuffles these cards and lays them down face up. At that point the players must vote, using tokens, which card they think was the storyteller’s card; the one that the phrase was originally based upon. It sounds complicated to put down into words, but once you’ve played it for the first time it’s really simple. The most interesting aspect of the game is the scoring system. At first glance of the rule book, when you realise that you get points from people correctly guessing your card, you’d think that you could wipe the floor with the other players by just creating a phrase that everyone could guess; however, that’s not how things work. If all of the players guess your card correctly you get absolutely no points at all. Conversely, if none of the players guess your card then you’ll also get no points. The art form in Dixit is to create a phrase that’s vague enough that only a few of the players will guess it, but not too vague that none of them will. It’s difficult to get used to, but once you do you’ll be coming up with some pretty interesting ideas, as will the other players, leading to a rather unorthodox, but enjoyable, gaming experience. The creativity of Dixit doesn’t stop at the rules of the game either: the cards that are included – of which there are 84 – each have individual works of art on them, created by Marie Cardouat. The enjoyment comes as much from looking at the art than it does from playing the game itself. Some of them are really crazy, and others are pretty obvious in what they’re attempting to portray but, to be honest, the crazy ones force the storyteller to come up with the weirdest and wackiest phrases to accompany their card, so they’re the most fun to play with. 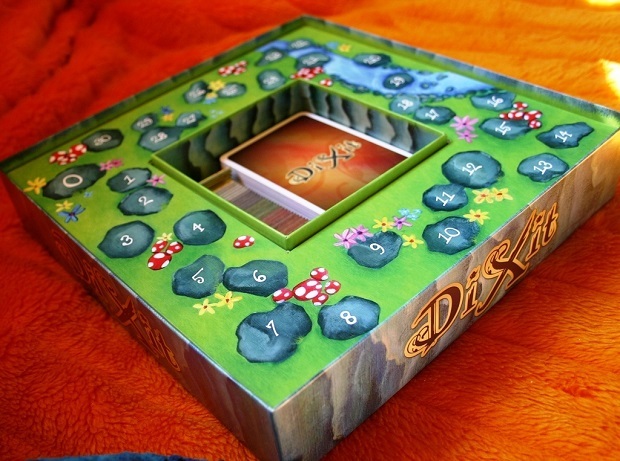 The biggest downside to Dixit is the fact that you can only really play the game with three or more people. For people that regularly have friends around for a game night, this isn’t going to be a problem. However, if you’re a gamer – like me – who plays board games with only one other person (in my case my wife), you could have a problem. It’s a problem that can be overcome with just a little bit of modification to the game rules – handing three cards to the storyteller instead of just one, for example – but be prepared for this if you’re more of a board-gaming couple than a board-gaming group. VERDICT: Dixit is an interesting game. It’s not something that most people will warm to straight away, being a little bit unconventional, but it’s certainly fun to play once you get into the swing of things; especially if you’re having a couple of drinks at the same time, making the phrases that are created progressively more crazy, and therefore more humorous. The cards are interesting pieces of art in their own right, and the concept of the game – especially the scoring system – has clearly been thoroughly thought through and honed to perfection. If you can’t get more than three people around, then it might be one to skip for now, but if you regularly get a bunch of friends in, Dixit could prove to be a very exciting change of pace.